We make this super easy, flavour-packed tuna salad all the time in my house. It's our favourite way to use up leftover basmati rice from the previous night's dinner. And it's definitely our favourite way to eat canned tuna. Seriously, tuna salad never tasted so good! 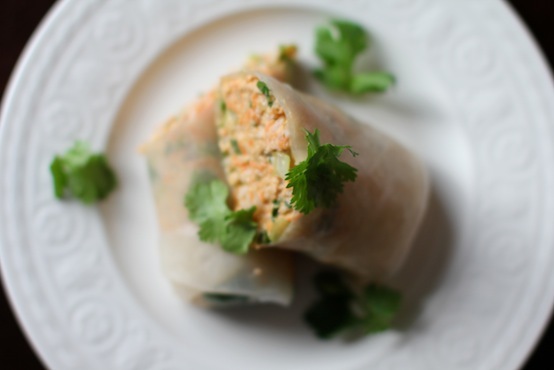 This recipe was inspired by the Thai tuna wraps they sell/sold at Starbucks. I'm not sure if they even make them anymore, but they were sooooo good! I ate a ridiculous amount of them during my medical training, when I needed a really quick bite to eat. To make the wrap filling, simply mix all the ingredients together in a large bowl. Roll up approximately 1/2 cup of the filling in either a warmed-up flour tortilla or a sheet of softened rice paper . *To soften rice paper, simply submerge 1 sheet at a time in a bowl of warm tap water for about 1 minute (until the sheet becomes soft and malleable). Then place it flat on a clean tea towel. 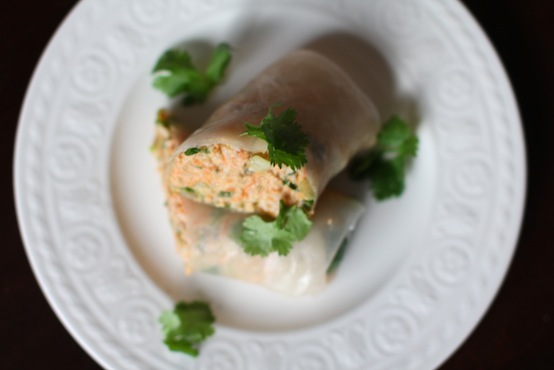 Add your filling in a vertical line down the center, fold over the bottom & top of the rice paper, and then roll up tightly from one side to the other. So happy to finally have a recipe for these! Thank-you. Holy night! This might become a staple in our house, too. Yum! And SOO gorgeous! Ah, no way! This was one of my favourite things at Starbucks, too, but I eventually ruled it out of my student budget. Can't wait to try this!